As your POMA government affairs consultant, with the direction and support of the Committee on Legislation and Public Policy, I am continuing to oppose any and all attempts to expand scope of practice for allied health care practitioners. POMA continues to support SB 780, the telemedicine proposal, which is poised for further action in the House next week; but its final outcome is still in doubt. Positioning of legislation for the new General Assembly has already begun as numerous proposals are being introduced to serve as placeholders for the new session. The Committee on Legislation and Public Policy will be convening apost session legislative strategy meeting to begin preparations for the next two-year legislative session. 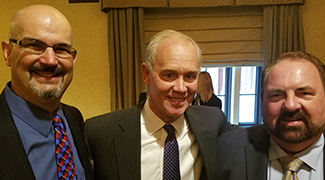 Pictured left to right: Gene Battistella, DO, Representative Mike Turzai, Speaker PA House of Representatives and George Vermeire, DO. These POMA members represented POMPAC at a recently conducted event in Pittsburgh. Discussions focused on POMA legislative priorities for the remainder of the legislative session.